If you can't find what you are looking for, please do not hesitate to get in touch with us and we will try to source it for you! We are adding items daily, and constantly updating our stock, so keep an eye out for our new products, as these items sell fast! This card has been designed by Gilli Reeves and is part of her 'Sewn Sentiments' range. It has been left blank inside for your own message. 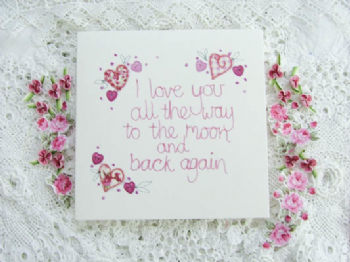 ''I love you all the way to the moon and back again"
Website going live today at 1pm!